I have worked at Monroe Harding for two years now and last week I got to go and experience my first adoption ceremony. I always get so excited when we have adoptions. While the journey in foster care for many can be long, hard and tiring, at the end of the day seeing kids get reunited with their birth family or adopted into a new forever family, is how we want the story to end. This year, we are trying something new and asking photographers that are willing to volunteer their time and services to take pictures of the adoptions for our families. This was the first time we were having a photographer come, so that’s why I went, to make sure it all went well. When I got there, our foster mom, Barbara Key was there with her two boys, Jeremiah and Elijah, as well as our Resource Manager, Shan, and Resource Specialist, Nevena. They are both pros at this, I am the newbie for sure. It was my first time in a courthouse that I can remember and I was so intrigued by everything. I may be in my 30s, but I was asking questions like my 7-year-old. When the courtroom opened up and we could go in, it was obvious by the few other people there that we were the only ones there for a happy reason. We sat through a few cases and then the judge called on us. And when he did, he had a huge smile on his face. He said, “Well I can tell you guys that this is going to be the best moment of my day”. He went on to say that he had read the home study and that Ms. Key was a very special lady. He said to the boys, “Do you know how special your mom is?” And I couldn’t agree with him more.. Sitting there I was really blown away by the choice she was willing to make and commit to this day. First, she committed to opening herself up to this journey of being a foster parent. Second, she has cared for those boys and advocated for them for three years while they have been in foster care. And third, when reunification wasn’t the best option for these boys, she said yes to being their forever mama! Now I don’t know the specifics, but I can tell that she is of the age where many folks wouldn’t want to be starting over with young kids. But she said Yes! I just can’t get over her selflessness. As I sat there thinking about that, I watched her take the oath to become their forever family. It brought me to tears. The ceremony was fast and then the judge was so sweet to bring the boys up to his bench to take some pictures and hit the gavel, which was absolutely adorable! And then Ms. Key said, “Tell him your name now”, and they proudly stated their names with their new last name of Key, which again, cue the waterworks of tears! And that was it, we left, took some pictures outside and then headed back to work. I continued to reflect as I was driving. Could I do that? Could I be courageous enough to say yes? And then I thought, Ms. Key probably doesn’t see herself as courageous, it’s just her way of life. Which led me to my next thought, I want to live life like that. It may not be that I am going to adopt two sweet little boys, but how can I support and celebrate that for people in my life? Maybe it’s a different task that requires me to give something up. I know Ms. Key has made sacrifices for those boys and will continue to do so. I have two little girls and I love them so much and want nothing but the best for them, but is there more that I can do? Ms. Key got me thinking about that last Wednesday, and I am still thinking about that today. I hope that you can be inspired by her actions to give a little more, love a little more and find a way to make an impact in this world for the good. 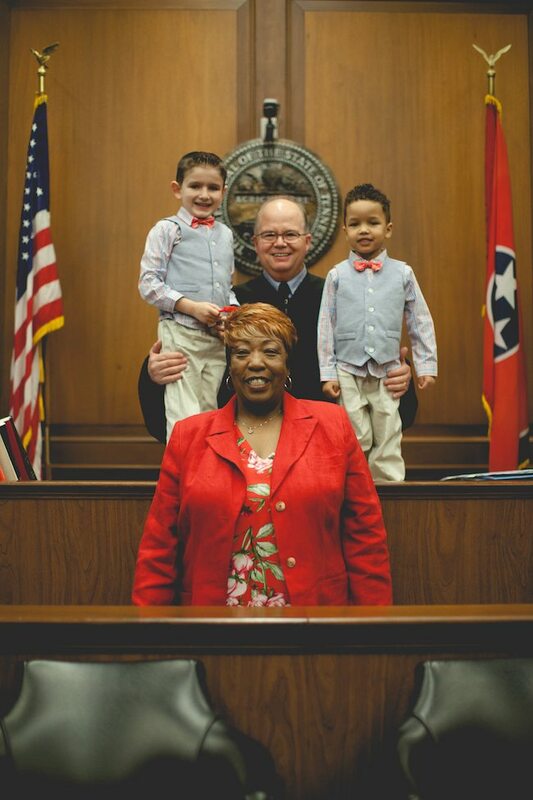 For her, it was saying yes to those two little boys a beautiful new forever family was formed!